Northrop Grumman Ship Systems' employees are working with local Wal-Mart stores and the Salvation Army to provide 100,000 bicycles for children in the hurricane-ravaged communities along the Mississippi, Alabama and Louisiana coastlines. To raise awareness for the event, community leaders and Wal-Mart employees are riding bikes along U.S. Highway 90 across the entire Gulf Coast. 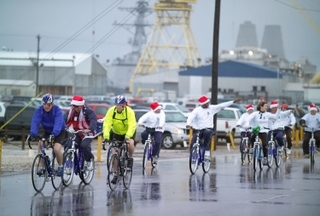 On Monday, Northrop Grumman employees who contributed to the cause were provided free coffee and pastries at the Pascagoula shipyard, while Richard Schenk, vice president of supply chain management (in blue) and Don Perkins, sector director of surface combatant contract administration (in yellow) joined other Northrop Grumman employees in leading the early-morning ride through Jackson County. Northrop Grumman Ship Systems will be collecting donations for the project through December 14.